My latest magazine pattern, Rosebud Hat, (which appears in Interweave Gifts, 2014) (and which was just talked about on the Knitting Daily blog this week) has what I would call a "blended spark" for its origin. I combined elements of contemporary textile design with my favorite traditional stranded colorwork. Though it might seem a stretch at first, it really started last September when I read this post by the well-known knitwear designer, Ysolda Teague. Ysolda modeled an outfit: skirt, tank and cardigan, that she made entirely by herself. 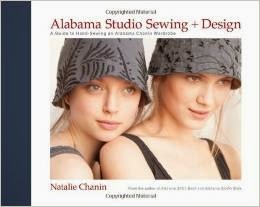 I used to sew a great deal, and I was very intrigued by the completely hand-stitched tank that she made using the book, Alabama Studio Sewing + Design: A Guide to Hand-Sewing an Alabama Chanin Wardrobe. In my sewing and needlecraft lifetime, I have already tried many, if not all, of the gorgeous fabric enhancement techniques: stenciling, embroidery, applique, quilting, reverse applique and bead and sequin embellishments. I find some of the pieces to be breathtakingly beautiful, as you can see from those that I have pinned (just pinned a couple more right now / can't help myself) on my "Stitchery" board at Pinterest. Do I have the time to make handsewn garments for myself? Of course not. But I thought a lot about how to capture the "all-over" designs in knitting. Most of the "fabric maps" are too large in scale for any of the accessory pieces that seem to be becoming my design niche. But I truly like the repetition-with-variation that I favor in all design and art. 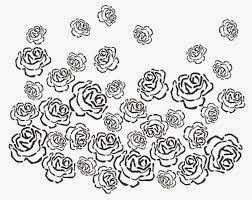 Do you see how the rose motif is copied in three different sizes and rotated in all directions? And I was inspired by the colors -- there are many shades of gray in the A.C. palette along with deep, moody, and sometimes, vibrant hues. I purchase some new yarn from my LYS (GYI), Baa Ram Ewe's Titus, in "aire" (blue) and "coal" (dark gray). At first, I thought that I might make a bucket shaped hat like those appearing on the book's cover, with a facing on the brim. 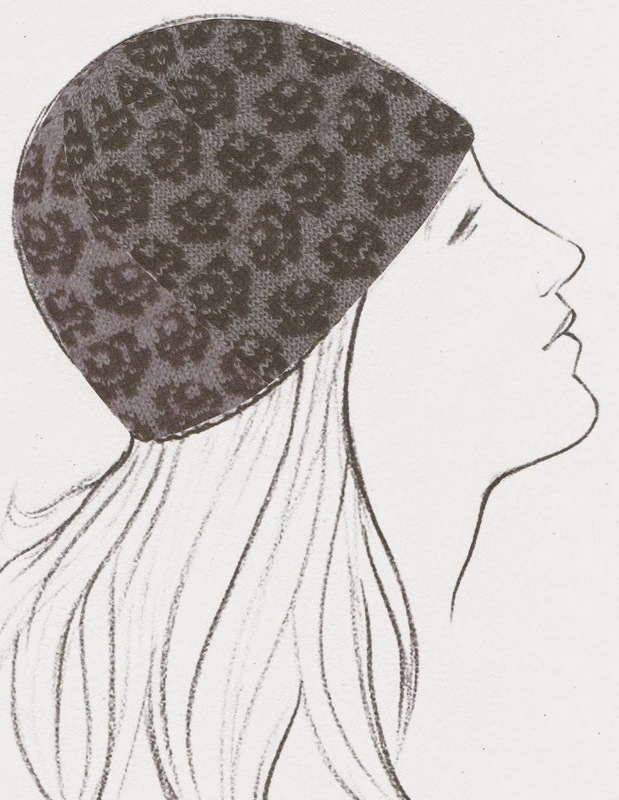 As my design evolved it did become a more wearable classic hat shape, but it does have a deeply faced hem that (according to the magazine copy) "gives it a polished finish and provides an extra layer of warmth". 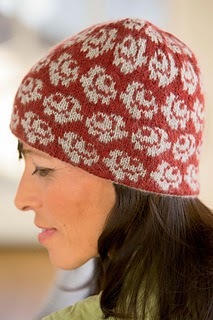 About the rosebuds: These are actually quite traditional in Fair Isle knitting. 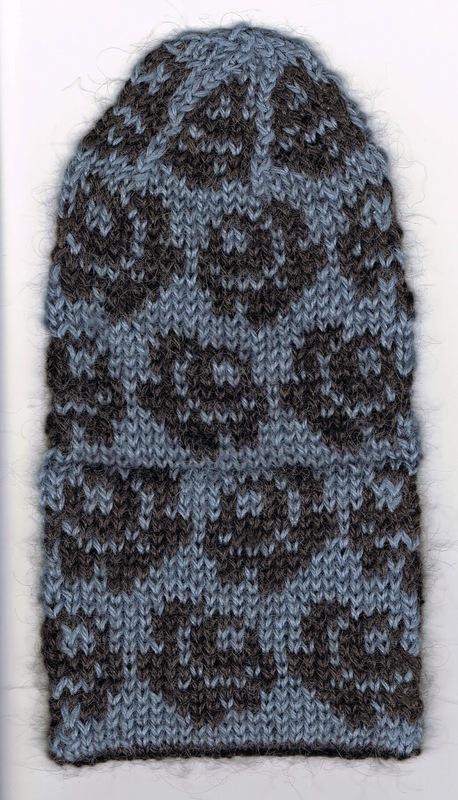 I charted a single rosebud motif and then I "changed the direction" by mirroring it, for what would be the row above. I made five different charts (really, I just checked) where I played around to get the spacing that I liked best. Later, it took a couple more charts to perfect the row of smaller rosebuds in the decreasing section at the top of the hat. This post is getting longish (and I always think that if I get too long, I will be boring you) but I am proud to share what I did when creating my design proposal which I sent to the editors at Interweave last October. First (after all the charting) came the swatch made with the above mentioned Titus yarn. This swatch was sent to the editors in Colorado. It is 4" wide and 8" tall. It is what I would call a hat "section". I did have to knit it back and forth, and not in the round, but that is not too difficult for me. It shows a two-repeat wide section of the hat with the "knitted-in" hem and the hat shaping with the reduced size rosebuds. Then for my "design sketch" I got very crafty. Thanks for reading! Knit Happy! I typed a comment here, but It seems to have disappeared. To reiterate I said, inspiration and innovation at its finest! I love the sketch...so fluid and expressive. Thanks so much for your comment, Dixie! I am not sure why your first one disappeared, but it was a treat to read this!